Neural cell development is regulated by membrane ion channel activity. We have previously demonstrated that cell membrane depolarization with veratridine or blockage of K+channels with tetraethylammonium (TEA) inhibit oligodendrocyte progenitor (OP) proliferation and differentiation (Knutson et al., 1997); however the molecular events involved are largely unknown. Here we show that forskolin (FSK) and its derivative dideoxyforskolin (DFSK) block K+ channels in OPs and inhibit cell proliferation. The antiproliferative effects of TEA, FSK, DFSK, and veratridine were attributable to OP cell cycle arrest in G1 phase. In fact, (1) cyclin D accumulation in synchronized OP cells was not affected by K+ channel blockers or veratridine; (2) these agents prevented OP cell proliferation only if present during G1 phase; and (3) G1 blockers, such as rapamycin and deferoxamine, mimicked the anti-proliferative effects of K+channel blockers. DFSK also prevented OP differentiation, whereas FSK had no effect. Blockage of K+ channels and membrane depolarization also caused accumulation of the cyclin-dependent kinase inhibitors p27Kip1 and p21CIP1 in OP cells. The antiproliferative effects of K+channel blockers and veratridine were still present in OP cells isolated from INK4a−/− mice, lacking the cyclin-dependent kinase inhibitors p16INK4a and p19ARF. Our results demonstrate that blockage of K+ channels and cell depolarization induce G1 arrest in the OP cell cycle through a mechanism that may involve p27Kip1 and p21CIP1 and further support the conclusion that OP cell cycle arrest and differentiation are two uncoupled events. Functional ligand- and voltage-gated ion channels have been identified in different subpopulations of neural precursor cells (Walton et al., 1993; Patneau et al., 1994; LoTurco et al., 1995; Van den Pol et al., 1995; Gallo et al., 1996; Steinhauser and Gallo, 1996; Bardoul et al., 1997; Sah et al., 1997; Sugioka et al., 1998), leading to the proposal that ion channel activity may regulate their development. Neural cell proliferation (Cone and Cone, 1976; Cone, 1980; Chiu and Wilson, 1989; LoTurco et al., 1995; Gallo et al., 1996; Knutson et al., 1997; Yuan et al., 1998; Ghiani et al., 1999), migration (Behar et al., 1998), and differentiation (Jones and Ribera, 1994; Gu and Spitzer, 1995; Spitzer, 1995; Gallo et al., 1996;Knutson et al., 1997; Yuan et al., 1998) are indeed influenced by activation of ligand- or voltage-gated ion channels. Voltage-gated K+ channels regulate cell proliferation in different eukaryotic cell types (Lewis and Cahalan, 1988; Chiu and Wilson, 1989; Puro et al., 1989; Amirogena et al., 1990;Nilius and Droogmans, 1994; Pappas et al., 1994; Gallo et al., 1996;Knutson et al., 1997). Distinct K+ currents are expressed during the mitotic cell cycle (Day et al., 1993, 1998; Pardo et al., 1998) and during embryonic development (Sontheimer et al., 1989; Wilson and Chiu, 1990; Attali et al., 1997; Knutson et al., 1997;Hallows and Tempel, 1998; Sobko et al., 1998). Glial cells display outward K+ currents during their proliferative phase, which are downregulated in quiescent or postmitotic states (Puro et al., 1989; Sontheimer et al., 1989; Barres et al., 1990; Gallo et al., 1996; Knutson et al., 1997; MacFarlane and Sontheimer, 1997). It has been hypothesized that voltage-dependent K+channel activity could regulate mitogenesis in the nervous system by maintaining the membrane potential hyperpolarized, a condition necessary for progression through G1 phase restriction points (Wonderlin and Strobl, 1996). Membrane potential-dependent transport of essential metabolic substrates during the cell cycle and/or volume regulation could also play a role (for review, see Wonderlin and Strobl, 1996). Blockage of K+ channels in glial cells, including oligodendrocyte progenitors (OPs), strongly inhibits proliferation (Wilson and Chiu, 1990; Pappas et al., 1994; Gallo et al., 1996; Attali et al., 1997; Knutson et al., 1997); however, the molecular mechanism by which K+ channel activity regulates mitogenesis is still unknown. In the present study, we investigated OP cell cycle regulation by K+ channel activity and membrane depolarization and analyzed whether (1) blockage of K+ currents or cell depolarization interfere with a specific phase of the OP cell cycle; and (2) cyclins and cyclin-dependent kinase inhibitors (cdkis) known to regulate cell cycle progression through this phase are affected by ion channel activity or changes in membrane potential. We demonstrate that K+ channel blockers and depolarizing agents cause G1 arrest in OP cell cycle and accumulation of p27Kip1and p21CIP1, two cdkis known to regulate cell proliferation and terminal differentiation in a variety of cell types (Ross, 1996; Casaccia-Bonnefil et al., 1997; Durand et al., 1997;Martin-Castellanos and Moreno, 1997). We also show that the G1 cdkis p16INK4a and p19ARF, belonging to a distinct gene family (Quelle et al., 1995) and involved in the regulation of glial cell proliferation (Jen et al., 1994; Schmidt et al., 1994; Holland et al., 1998), are not involved in ion channel-dependent cell cycle arrest in OP cells. Materials. Platelet-derived growth factor (PDGF; human, AB, heterodimer form) and basic fibroblast growth factor (bFGF; human) were both from Upstate Biotechnology (Lake Placid, NY). Protease was from Sigma (St. Louis, MO; catalog #P6911). Isoproterenol, veratridine, forskolin, dideoxyforskolin, tetraethylammonium chloride (TEA), kainate, deferoxamine, and nocodazole were all from Sigma. Rapamycin and SKF96365 were from Biomol (Plymouth Meeting, PA). Methyl-[3H]thymidine was from Amersham (Arlington Heights, IL). Anti-cyclin D antibodies (anti-human, polyclonal) were from Upstate Biotechnology. Anti-p27Kip1, anti-p21CIP1, and anti-p15INK4bwere from Santa Cruz Biotechnology (Santa Cruz, CA). All secondary antibodies were from Cappel-Organon Teknika (Durham, NC). Cell culture. Purified cortical OP cell cultures were prepared as previously described (Gallo and Armstrong, 1995; Gallo et al., 1996) from E20 Sprague Dawley rats. The animals were killed following National Institutes of Health animal welfare guidelines. OP cells were plated onto poly-d-ornithine-coated plates (0.1 mg/ml) and cultured in DMEM-N1 biotin-containing medium. After 2 hr, PDGF (10 ng/ml), bFGF (10 ng/ml), or PDGF plus bFGF (10 ng/ml each) was added to the culture medium. OP cells were cultured for 1–3 d and treated every 24 hr with PDGF and/or bFGF. OP cells were synchronized for 24–48 hr in DMEM-N1 biotin-containing medium and then treated with growth factors (PDGF or bFGF). OP cells cultured from mice carrying the INK4a deletion (Serrano et al., 1996) were prepared from P1 pups, following the same protocol used for the rat progenitor cells. Purified rat and mouse OP cells used for immunostaining were grown on glass coverslips precoated with poly-d-ornithine. Previously, we demonstrated that 100% of the rat cells expressed nestin, and >90% of the nestin+ cells were GD3+ or A2B5+. Less than 5% of OP cells were O4+, and O1+ cells were absent in the rat cultures (Gallo and Armstrong, 1995; Gallo et al., 1996). Immunocytochemical characterization of the cortical INK4a−/− mouse cultures demonstrated that >95% of the cells were OPs, based on the following criteria: (1) positive staining with an antiserum against NG2 proteoglycan (Stallcup and Beasley, 1987; Durand et al., 1998); (2) positive staining with anti-GAP-43 antibodies (Curtis et al., 1991; Fanarraga et al., 1995); (3) nestin expression, as detected with anti-nestin antibodies (Gallo and Armstrong, 1995); (4) small percentage (<5%) of O4+ cells (Fanarraga et., 1995; Gallo and Armstrong, 1995); and (5) bipolar or monopolar morphology (Fanarraga et al., 1995;Gallo and Armstrong, 1995). In agreement with previous reports (Fanarraga et al., 1995; Durand et al., 1998), the majority of the cortical mouse OP cells were not stained with A2B5 or anti-GD3 antibodies. In the INK4−/− mouse cultures, GAP-43 expression was downregulated in the small percentage of O4+ cells present compared with OPs (also seeFanarraga et al., 1995). No GFAP+ cells were detected in the purified mouse INK4−/− OP cells. Cerebellar organotypic slice cultures and cell dissociation.Cerebellar organotypic slice cultures were prepared and processed as previously described (Yuan et al., 1998). Cerebella were dissected from postnatal day 6 Sprague Dawley rats and sagittally sliced (450 μm) using a Mcllwain tissue chopper (Mickle Laboratory Engineering Co. Ltd.). Slices were placed on 0.5 μm LCR sterile membrane filters (Millipore, Bedford, MA) in 24-mm-diameter sterilized sieves (Netwell inserts, 500 μm mesh size; Fisher Scientific, Pittsburgh, PA) and cultured in DMEM-N1 medium containing 10% FBS (HyClone, Logan, UT) in six well plates (Falcon; Becton Dickinson, Franklin Lakes, NJ). Groups of four to six cerebellar slices were placed on each filter and maintained in culture for a total of 48–72 hr. TEA (1–10 mm) was added to the slices for 48 hr. Bromodeoxyuridine (BrdU, 50 μm; Sigma) was added to the slices for the last 24 hr. After 72 hr in culture, cerebellar slices were treated with protease (1.5 mg/ml) for 5 min at 37°C and with trypsin inhibitor (0.65 μg/ml; Sigma) for 5 min at 4°C. Cells were then dissociated by trituration through a Pasteur pipette (35 strokes) and plated on poly-d-ornithine-coated 25-mm-diameter coverslips at a density of 2 × 106 cells per coverslip in 200 μl of DMEM-N1 plus 10% FBS for immunocytochemistry. Cells were stained and analyzed 2 hr after plating. Cell proliferation assays in culture. Cell proliferation was assayed as previously described (Gallo et al., 1996; Knutson et al., 1997). Purified cortical OP cells were plated in DMEM-N1 biotin-containing medium with 0.5% FBS in 24 multiwell plates at a density of 3 × 104cells/cm2. After 2 hr, PDGF and/or bFGF and kainate, forskolin, or dideoxyforskolin were added to the cultures along with methyl-[3H]thymidine (0.5 μCi/ml, 85 Ci/mmol). Unless otherwise stated, cells were lysed after 22 hr, and [3H]thymidine incorporation was measured by precipitation with 10% trichloroacetic acid and scintillation counting. [3H]thymidine incorporation assays in synchronized OP cells were performed by culturing the cells without growth factors for 24 hr and treating them with either PDGF or bFGF. Veratridine, TEA, dideoxyforskolin, rapamycin, deferoxamine, aphidicolin, SKF96365, and nocodazol were either added together with the growth factors or 6–24 hr after. Twelve hours after the stimulation with growth factors, cells were labeled with [3H]thymidine and harvested 18 hr later to measure [3H]thymidine incorporation. Immunocytochemistry and counting of cell cultures and dissociated cells. The primary antibodies used were LB1 (Levi et al., 1986;Curtis et al., 1988), NG2 (Stallcup, 1981), A2B5 (Eisenbarth et al., 1979), nestin (Tohyama et al., 1992; Gallo and Armstrong, 1995), O4 (Sommer and Schachner, 1981), O1 (Sommer and Schachner, 1981), and anti-BrdU (Dako, Carpinteria, CA). Double indirect immunofluorescence experiments in rat and mouse cultures were performed as previously described (Gallo and Armstromg, 1995; Gallo et al., 1996; Yuan et al., 1998; Ghiani et al., 1999). For cell counting, 10–20 microscopic fields (Axiophot fluorescence microscope, 40× objective; Zeiss, Thornwood, NY) were counted for each coverslip, and two coverslips for each experiment were analyzed. At least three independent experiments were performed for each antibody, corresponding to a total of several thousands of cells counted (see figure legends). Data are presented as averages ± SEM. Western blot analysis. OP cells were treated for 48 hr with growth factors and drugs. Cells (2 × 106) were then washed twice and harvested in ice-cold PBS. The cells were resuspended in 100–300 μl of sample buffer [150 mmTris-HCl, pH 6.8, 150 mm NaCl, 1 mm EGTA, 1 mm Na3VO4, 1 mmNaF, 0.25% Na+-deoxycholate, 10 μg/ml leupeptin, 1 μg/ml aprotinin, and 1 mm4-(2-aminoethyl)benzenesulfonyl fluoride hydrochloride] and lysed by sonication. The lysate was clarified by centrifugation at 5000 × g for 15 min, and the supernatant was collected. An aliquot was taken for protein determination using the Pierce (Rockford, IL) BCA* protein assay kit, and 20–50 μg of cell extracts were resolved on a 12–15% mini SDS-polyacrylamide gel and transferred to Immobilion polyvinylidene fluoride membranes (Millipore, Marlborough, MA). Blots were blocked with 5% nonfat dry milk in PBS-T (17 mm KH2PO4, 50 mm Na2HPO4, 1.5 mm NaCl, pH 7.4, and 0.05% Tween 20) for 1 hr at room temperature and then incubated at room temperature for 2 hr in PBS-T and 5% nonfat dry milk containing one of the following antibodies: anti-cyclin D, anti-p27Kip1, anti-p21CIP1, or anti-p15INK4b. Protein bands were detected using the Amersham ECL kit with horseradish peroxidase-conjugated secondary antibodies. Relative intensities of the protein bands were quantified by scanning densitometry (Scanwizard Plug-in; Microtek, Redondo Beach, CA). Terminal deoxynucleotidyl transferase-mediated dUTP nick end-labeling assays. Apoptotic cell death was determined by fluorescence microscopy by using the terminal deoxynucleotidyl transferase-mediated biotinylated dUTP nick end-labeling (TUNEL) assay (Boehringer Mannheim, Indianapolis, IN). Synchronized cultured OP cells were fixed in 4% paraformaldehyde, permeabilized in 0.1% Triton X-100 and 0.1% sodium citrate (2 min at 4°C), and stained with TUNEL according to manufacturer. Apoptotic OP cells were brightly fluorescent. For cell counting, 10 microscopic fields (Zeiss Axiophot fluorescence microscope, 40× objective) were counted for each coverslip, and two coverslips were analyzed for each experiment. A total of two independent experiments were performed. Dividing OP cells display outward K+ currents that are blocked by TEA, 4-aminopyridine, and quinine (Knutson et al., 1997). Among these agents, only TEA was not toxic to OP cells when tested in long-term cell proliferation assays (Knutson et al., 1997; C. A. Ghiani and V. Gallo, unpublished results). 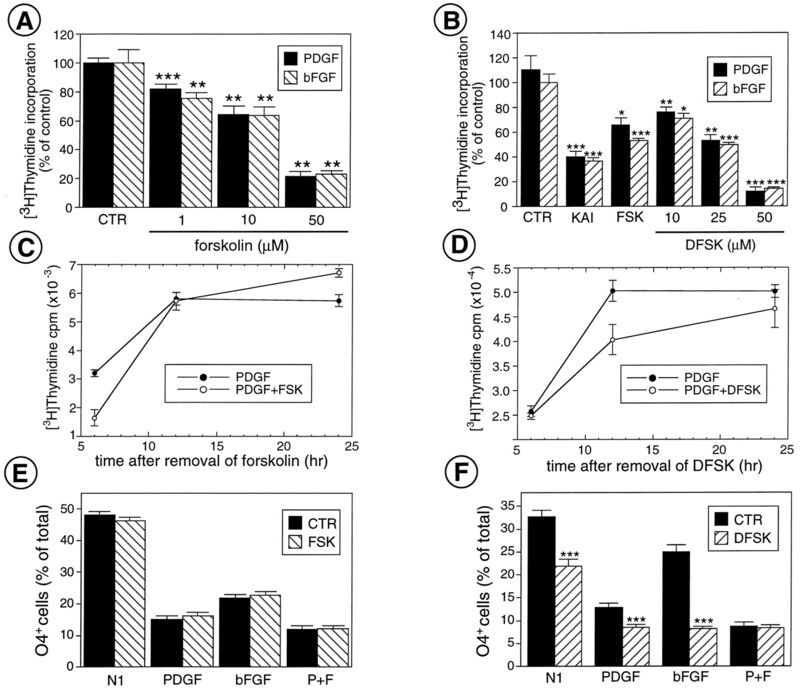 In search of other compounds that would block K+ currents in OP cells, we analyzed the effects of forskolin (FSK), which is known to cause cAMP-independent blockage of voltage-dependent K+ channels (Laurenza et al., 1989). At a test pulse of +70 mV, FSK dose-dependently reduced the sustained current amplitude (measured at a time point of 250 msec). At concentrations of 5, 50, and 200 μm, the current amplitude was blocked by 39.9 ± 4.2% (n = 3), 65.8 ± 4.5% (n = 11), and 92.7 ± 1.5% (n = 3), respectively (Fig.1). Interestingly, FSK increased the rate of inactivation of the sustained current component. In control conditions the sustained current inactivated with a single time constant of 125.8 ± 2.4 msec (n = 8). At a concentration of 200 μm FSK, the sustained current component inactivation was best fit with two time constants of 26.2 ± 15.4 and 269.7 ± 68 msec (n = 3). This mechanism of block by FSK is similar to that described previously in nudibranch neurons, PC12 cells, and human T cells (Coombs and Thompson, 1987; Hoshi et al., 1988; Krause et al., 1988) and is thought to occur by an open channel blocking mechanism and is cAMP-independent. To test this hypothesis we used dideoxyforskolin (DFSK), the naturally occurring analog of FSK, which does not activate adenylate cyclase (for review, see Laurenza et al., 1989). Addition of DFSK also blocked the sustained current component. At a concentration of 50 μm, DFSK blocked the sustained current component by 62.2 ± 4.7% (n = 5). Similar to FSK, DFSK also increased the rate of current inactivation (Fig. 1). In the presence of DFSK, the sustained current inactivated with two time constants of 32 ± 14 and 152 ± 21.6 msec (n = 5) (cf. 129.8 ± 7.5 msec in control). These data suggest that DFSK and FSK act to directly block the sustained current and do not require activation of adenylate cyclase for the blocking mechanism. 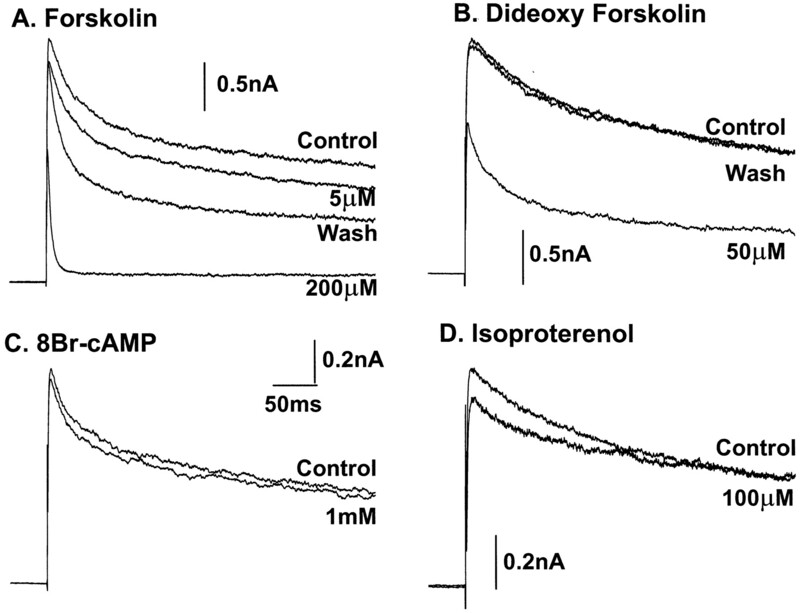 Forskolin reversibly blocks potassium channels and increases the rate of current inactivation by a cAMP-independent mechanism in oligodendrocyte progenitor cells. A, Forskolin dose-dependently blocks potassium currents activated at a test pulse of +70 mV. Each trace represents the average of 5–8 test pulses. Forskolin, 5 and 200 μm, blocks the outward current by 17 and 94.5%, respectively, at a time point of 250 msec. In addition, the rate of current inactivation is increased in the presence of forskolin. In control conditions, current inactivation could be fit by two time constants of 21 and 148 msec, respectively. In the presence of 200 μm forskolin, the current inactivation was best fit by an exponential with two time constants of 6 and 408 msec, respectively. B, Dideoxyforskolin similarly blocked outward currents. At a concentration of 50 μm dideoxyforskolin blocked 65% of the outward current. Like forskolin, dideoxyforskolin increased the rate of current inactivation. In control conditions the outward current inactivation was best fit by a single exponential of 143 msec. In the presence of dideoxyforskolin, the current inactivation was best fit by the sum of two exponentials with time constants of 20 and 129 msec, respectively.C, D, In contrast, agents that elevate intracellular cAMP levels, 8-Br-cAMP and the β-adrenergic agonist isoproterenol, blocked only 7 and 3% of the outward current, respectively, and had no effect on the rate of current inactivation. To determine whether the activation of adenylate cyclase by forskolin has an additional effect on the sustained current component, we used the analog 8-bromo-cAMP (8-Br-cAMP). Unlike FSK, a maximal concentration of 8-Br-cAMP (1 mm) blocked only 23 ± 1.4% (n = 4) of the sustained current component. Furthermore, 8-Br-cAMP was without effect on the time course of current inactivation, suggesting that the primary effect of FSK on the sustained current does not involve activation of adenylate cyclase or an elevation of cAMP levels. Similarly, the β-adrenergic receptor agonist isoproterenol, which also elevates cAMP levels in OP cells (Ghiani et al., 1999), was without effect on the sustained current recorded in these cells. At a concentration 100 μmisoproterenol the sustained current component was 95.9 ± 1.1% of control (Fig. 1). Previously we have shown that long-term culture (24 and 48 hr) in the presence of the antiproliferative agents isoproterenol and 8-Br-cAMP modified the properties of the sustained currents in proliferating OP cells (Ghiani et al., 1999). Both agents caused a rightward shift in the voltage dependence of activation, which was presumably responsible for their antiproliferative behavior. In the present experiments, neither FSK nor DDFSK altered the passive properties of the OP cells (Table 1). Similarly, the voltage-dependent properties of the sustained currents in OP cells were unaffected (Table 1). In contrast, the current density of the sustained current measured at +70 mV was significantly reduced after 48 hr treatment with both FSK and DDFSK. We have previously demonstrated that agents that block K+ currents (TEA) or cause cell membrane depolarization (veratridine) inhibit OP cell proliferation and lineage progression (Gallo et al., 1996; Knutson et al., 1997). We therefore tested the effects of FSK and DFSK on OP cell proliferation and development. [3H]Thymidine incorporation was significantly inhibited by culturing OP cells in the presence of either PDGF or bFGF together with increasing concentration of FSK or DFSK (Fig. 2A,B). 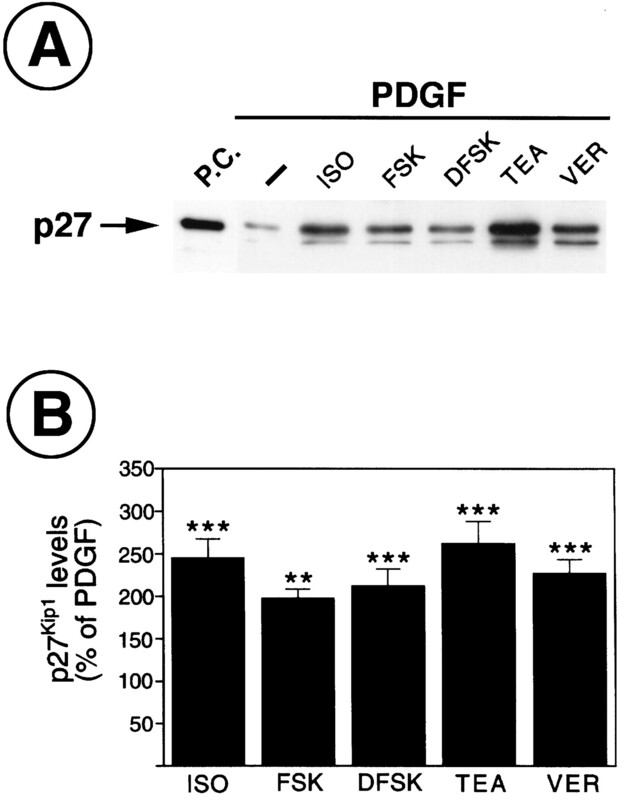 The effect elicited by FSK was concentration-dependent, with an IC50of 21 ± 1 and 22 ± 3 μm (n = 6) in PDGF and bFGF, respectively. DFSK displayed an IC50of 30 ± 5 and 27 ± 5 μm in PDGF and bFGF, respectively. The effects of both drugs were reversible within 24 hr (Fig. 2C,D). 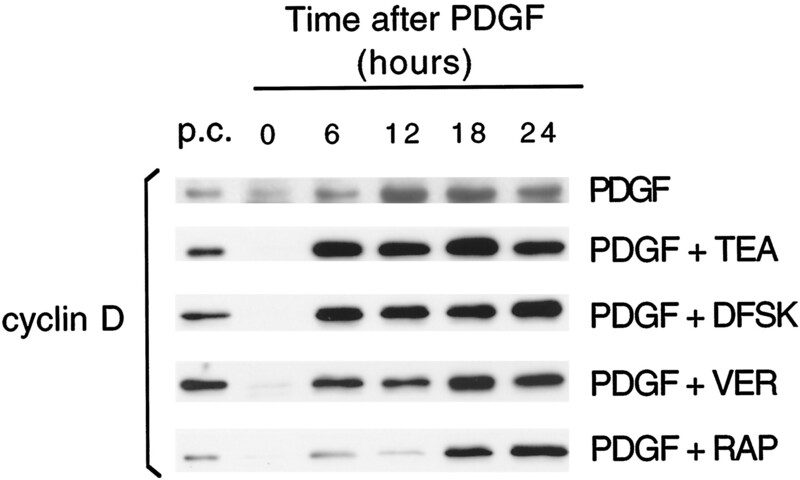 Progenitor cells that were cultured in the presence of PDGF and FSK or DFSK for 24 hr and then [3H]thymidine-pulsed in agent-free medium containing PDGF reentered S phase with a temporal pattern similar to OP cells that were never exposed to FSK or DFSK. This was consistent with the lack of long-term effect of FSK and DFSK on K+channel properties (Table 1). Neither FSK nor DFSK significantly affected OP cell viability within the concentration range tested (data not shown). Forskolin and dideoxyforskolin reversibly inhibit oligodendrocyte progenitor cell proliferation. A, B, FSK and DFSK inhibit OP cell proliferation at concentrations that also block K+ currents. Cells were plated in 24 well plates (3 × 104 cells per well). After 2 hr, PDGF or bFGF (both 10 ng/ml) in combination with forskolin or dideoxyforskolin were added to the culture medium along with [3H]thymidine (0.5 μCi/ml). After 22 hr, [3H]thymidine incorporation was measured by trichloroacetic acid precipitation and scintillation counting. InB, kainate (KAI; 100 μm) was used as a positive control, and forskolin (25 μm) was used for a direct comparison with DFSK. CTR, Control, cells cultured in PDGF or bFGF alone. Averages ± SEM obtained from three to six independent experiments run in triplicate are shown. ***p < 0.0001; **p < 0.01; *p < 0.05 compared with respective control (PDGF- or bFGF-cultured cells; Student’s t test). C, D, The antiproliferative effects of forskolin and dideoxyforskolin are reversible. OP cells were cultured in PDGF (10 ng/ml) in the presence or absence of forskolin (25 μm) or dideoxyforskolin (25 μm). After 22 hr, all cells were placed in fresh culture medium without inhibitors containing PDGF (10 mg/ml) and [3H]thymidine (0.5 μCi/ml). OPs were harvested after 6, 12, and 24 hr of inhibitor-free medium, and [3H]thymidine incorporation was determined by trichloroacetic acid precipitation and scintillation counting. Averages ± SEM (n = 3) are shown. E, F, Treatment with dideoxyforskolin prevents OP lineage progression, whereas forskolin does not affect OP development. Immunohistochemical staining of oligodendrocyte lineage cells with the monoclonal antibody O4. OP cells were purified and cultured on coverslips in DMEM-N1 medium and 0.5% fetal bovine serum with PDGF (10 ng/ml), bFGF (10 ng/ml), or PDGF and bFGF (P+F; both 10 ng/ml). Forskolin and dideoxyforskolin (both 50 μm) were added to the cultures 2 hr after plating. After 46 hr, cells were immunostained with O4 and counted. Averages ± SEM obtained from three to five experiments are shown (n = 30–50 microscopic fields counted). The total number of cells counted for each culture condition ranged between 1755 and 10,137. ***p < 0.001 compared with respective controls (Student’s ttest). In conclusion, these results are in agreement with previous studies showing that FSK causes a cAMP-independent blockage of K+ current in a variety of cell types (Coombs and Thompson, 1987; Hoshi et al., 1988; Castle, 1989; Laurenza et al., 1989; Baxter and Byrne, 1990; Zerr and Feltz, 1994; Herness et al., 1997) and that agents that directly block K+channels or modulate K+ channel activity also have an antiproliferative effect on OP cells (Gallo et al., 1996; Attali et al., 1997; Knutson et al., 1997) . We tested whether FSK and DFSK reproduced the effects of the specific K+ channel blocker TEA, which prevented OP lineage progression by reducing the percentage of O4+ preoligodendroblasts (Gallo et al., 1996). As shown in Figure 2E, FSK did not affect OP lineage progression under any of the culture conditions tested. However, DFSK significantly decreased the percentage of O4+ cells in OPs cultured under conditions that favored lineage progression (Fig.2F). The lack of effect of FSK on OP lineage progression might be explained by the fact that this agent blocks K+ channels but is also a direct activator of adenylate cyclase (Laurenza et al., 1989), and it has been shown that an elevation of cAMP levels in OPs promotes cell differentiation (Pleasure et al., 1986; Raible and McMorris, 1989, 1993; Ghiani et al., 1999). Glial cell proliferation may be differentially regulated in intact tissue than observed in purified cultures. For example, an elevation of intracellular cAMP inhibits Schwann cell proliferation in peripheral rat sciatic nerve segments (Fex Svenningsen and Kanje, 1998), whereas it strongly stimulates mitotic activity in purified cultures (Raff et al., 1978; Stewart et al., 1991). We have, therefore, extended our analysis of proliferation and differentiation of oligodendrocyte lineage cells to a cytoarchitecturally intact system, cerebellar slice cultures. In these slices, OPs and preoligodendroblasts proliferate and differentiate in vitro (Yuan et al., 1998). In a previous report, we showed that glutamate receptor agonists inhibit OP proliferation and differentiation in cerebellar slice cultures, and this effect is most likely attributable to an increase in intracellular Na+ and consequent block of K+current (Knutson et al., 1997; Yuan et al., 1998). On this basis, we examined whether OP cell proliferation and differentiation in cerebellar slice cultures was affected by blocking K+ channels with TEA. Incubation of cerebellar slices with 1 mm TEA for 24 hr caused a 75% reduction in the percentage of NG2+ OP cells and a 50% decrease in their BrdU incorporation (Fig.3A,B). The K+ channel blocker also greatly reduced the percentage and BrdU labeling index of O4+pro-oligodendroblasts (Fig. 3C,D). 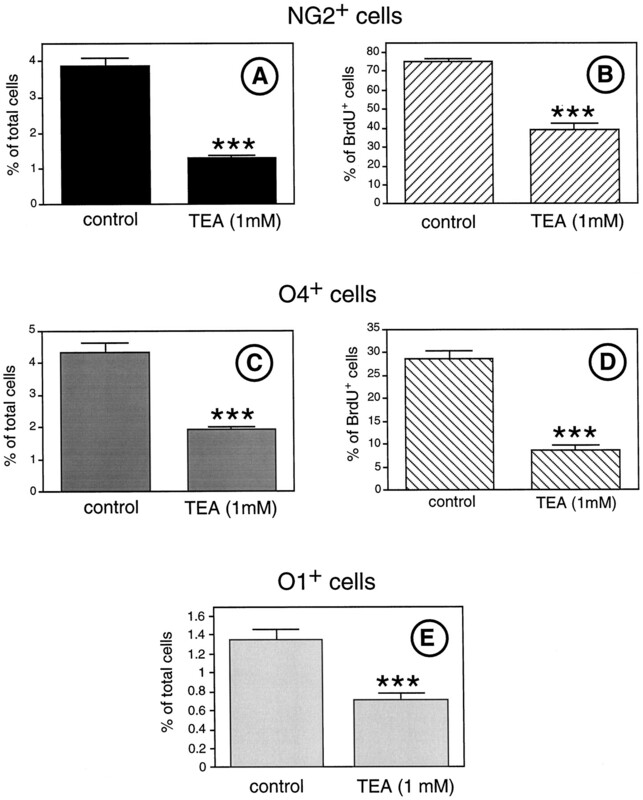 Consistent with these findings, the percentage of O1+ oligodendrocytes was also decreased by ∼50% after treatment with TEA (Fig.3E). The effects of TEA were dose-dependent, because the percentage of OP cells and pro-oligodendroblasts was further decreased (80 and 65% decrease, respectively) by 10 mm TEA (data not shown). Blockage of K+ channels inhibits OP proliferation and development in cerebellar slice cultures. Quantitative analysis of cerebellar cells dissociated from P6 rat slice cultures and treated for 48 hr with the K+ channel blocker TEA (1 mm). Control, no TEA. All tissue slices were treated with BrdU for 24 hr. Cells were dissociated and stained with NG2 and anti-BrdU (A, B), O4 and anti-BrdU (C, D) or O1 and anti-BrdU (E). As previously demonstrated (Yuan et al., 1998), none of the O1+cells was BrdU+. A total of six coverslips (10 fields per coverslip) were counted for each antibody staining from three independent experiments. Between 25,064 and 47,083 total cells were counted for each culture condition, using phase-contrast imaging. Data represent averages ± SEM (n = 60 microscopic fields counted per antibody combination). ***p < 0.0001 compared with their respective controls (Student’s t test). In conclusion, blockage of K+ channels in cells of the oligodendrocyte lineage reduced proliferation and prevented lineage progression also in cerebellar tissue slices, as previously demonstrated with GluR agonists (Yuan et al., 1998). We reported that OP cells can be synchronized by culturing them in the absence of growth factors for 48 hr and then adding PDGF (Ghiani et al., 1999). Cyclin D1 expression is very low in purified OP cells cultured without growth factors and upregulated within 6 hr after treatment with PDGF, indicating that OPs reenter G1 phase (Fig.4). Cyclin D1 expression reached a plateau 18 hr after treatment with the growth factor and displayed a decrease between 18 and 24 hr (Fig. 4; also see Ghiani et al., 1999). Cell depolarization with the Na+ channel opener veratridine or blockage of voltage-dependent K+channels with TEA or DFSK did not modify cyclin D1 accumulation (Fig.4), indicating that OP cell entry into G1 phase was not affected by changes in membrane potential. Consistent with this interpretation, treatment with the G1 blocker rapamycin also did not modify cyclin D1 accumulation in synchronized OP cells (Fig. 4). K+ channel blockers and depolarizing agents do not affect G0–G1 transition in synchronized oligodendrocyte progenitors. Time course of cyclin D expression as determined by Western blot analysis. 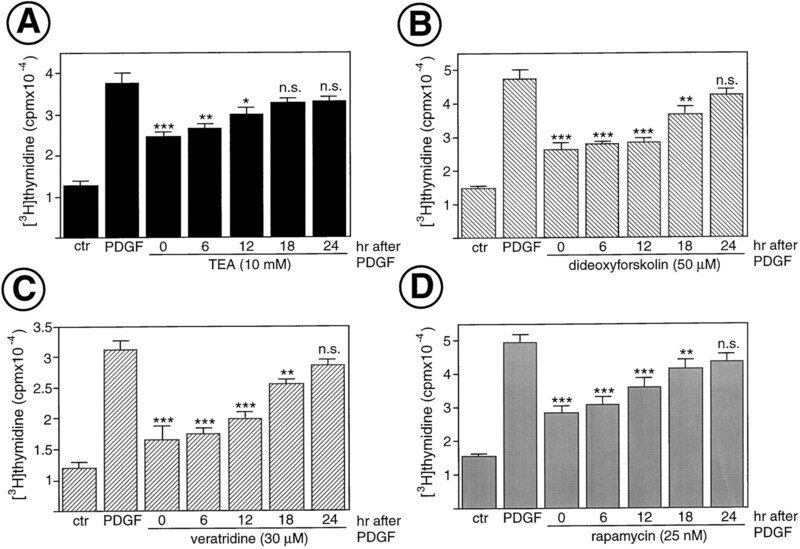 Oligodendrocyte progenitor cells were synchronized by culturing in the absence of growth factors for 48 hr and treated with PDGF (10 ng/ml) in the presence or in the absence of TEA (10 mm), DFSK (50 μm), veratridine (VER; 30 μm), or rapamycin (RAP; 25nM). Cells were harvested at different times after re-adding PDGF and the antiproliferative agents (0–24 hr). Cyclin D expression was analyzed with anti-cyclin D polyclonal antibodies that recognized both cyclin D1 and D2. The major band identified by the antibody is cyclin D1 (36 kDa). p.c., Positive control; purified cyclin D1 protein comigrates with the cyclin D1 from OP cells. Twenty micrograms of total proteins were loaded on the gel for each sample. To determine whether veratridine, TEA, or DFSK specifically affected a phase of the cell cycle that precedes S phase, these agents were added at different times to synchronized OP cells treated with PDGF. Maximal inhibitory effects were observed when one of the three agents was added to the cultures within 12 hr after the growth factor (Fig.5A–C). The G1 blocker rapamycin displayed a time course of inhibition similar to veratridine, TEA, and DFSK. None of the treatments caused apoptosis in OP cells, as determined by TUNEL assays (data not shown). The antiproliferative effect of K+ channel blockers and depolarizing agents is attributable to G1 arrest in OP cell cycle. TEA, dideoxyforskolin, veratridine, and rapamycin lose their antiproliferative effects as OP cells proceed through the cell cycle. The G1 blocker rapamycin was used as a positive control. [3H]Thymidine incorporation assays were performed on synchronized cells, which were pulsed with PDGF (10 ng/ml). TEA (A; 10 mm), dideoxyforskolin (B; 50 μm), veratridine (C; 30 μm) or rapamycin (D; 25nM) was added to the culture medium at the same time as PDGF or 6–24 hr later. [3H]Thymidine was added to the cultures 12 hr after PDGF. OP cells were harvested 30 hr after PDGF addition, and [3H]thymidine incorporation was determined by trichloroacetic acid precipitation and scintillation counting. TEA, veratridine, dideoxyforskolin, and rapamycin prevented OP cells from entering S phase only if added to synchronized cells within 12–18 hr after PDGF. Data represent averages ± SEM of two or three experiments performed in triplicate (n = 6–9 wells). A, ***p < 0.0005; **p < 0.005; *p < 0.05 compared with PDGF. B, ***p < 0.0001; **p < 0.0005 compared with PDGF.C, ***p < 0.005; **p < 0.05. D, ***p < 0.005; **p < 0.05 compared with PDGF. n.s., Not significant. A variety of cell cycle inhibitors were tested in synchronized OP cells to compare their effects with those of K+ channel blockers and of veratridine. All these agents were used in a concentration range that was not toxic to OP cells. Figure6 shows that, in cells cultured in PDGF or bFGF the G1 and G1–S blockers deferoxamine, rapamycin, and aphidicolin inhibited OP cell cycle progression to the same extent as TEA, whereas the G2–M and M blockers SKF96365 and nocodazol did not affect [3H]thymidine incorporation into OP cells (Fig. 6A,B). Agents that cause G1 arrest in mitotic cell cycle mimic the effects of K+ channel blockage on oligodendrocyte progenitor proliferation. [3H]Thymidine incorporation assays were performed in OP cells synchronized by culturing in the absence of growth factors for 24 hr and treated with PDGF (10 ng/ml) or bFGF (10 ng/ml). Rapamycin (RAP; 3–30nM), deferoxamine (DFRX; 0.3–1 mm), aphidicolin (APH; 1–3 μm), SKF96365 (SKF; 0.1–0.3 μm), nocodazole (NOC; 0.03–0.1 μg/ml), or TEA (10 mm) was added together with [3H]thymidine and the growth factors. The concentrations of antiproliferative agents used were not toxic and did not cause visible morphological changes in OP cells. Cells were harvested 24 hr later to measure thymidine incorporation by trichloroacetic acid precipitation and scintillation counting.N1, Cells cultured without growth factors;ctr, control, cells cultured in PDGF or bFGF alone. Data represent averages ± SEM of three to five experiments run in triplicate (n = 9–15). A, ***p < 0.0001; **p < 0.001 compared with PDGF. B, ***p < 0.0001; **p < 0.005; *p < 0.05 compared with bFGF. Altogether, these results indicate that membrane depolarization causes a block in G1 phase of the OP cell cycle and prevents G1–S transition, as previously demonstrated for GluR activation (Ghiani et al., 1999). Eukaryotic cell cycle progression is tightly regulated by the activity of several cyclin-dependent kinases (cdks) and cdkis (Ross, 1996). We analyzed the involvement of members of two families of cdkis that are known to act in the G1 phase of the cell cycle. TheINK4 family comprises p15INK4b, p16INK4a, p18INK4c, and p19ARF, whereas the Kip/CIP family comprises p21CIP1, p27Kip1, and p57Kip2 (Martin-Castellanos and Moreno, 1997). Induction of one or several of these proteins by antiproliferative signals prevents G1–S transition in the cell cycle (Martin-Castellanos and Moreno, 1997). The role of p16INK4a and p19ARFwas analyzed in OP cells isolated from mice carrying a targeted deletion of the INK4a locus, i.e., deficient for both these gene products (Serrano et al., 1996). The mouse cultures prepared from the knock-out mutants displayed morphological and antigenic properties previously described for wild-type mouse OPs (Stallcup and Beasley, 1987; Fanarraga et al., 1995; Durand et al., 1998; Ghiani et al., 1999). More than 95% of the cells were NG2+, nestin+ OPs (also see Ghiani et al., 1999). 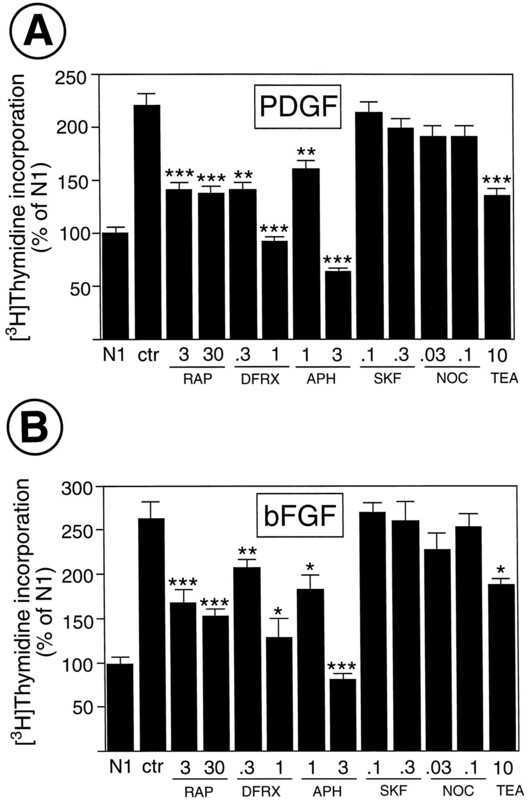 [3H]Thymidine incorporation assays inINK4a−/− OPs demonstrated that veratridine, FSK, DFSK, and TEA significantly inhibited cell proliferation stimulated by PDGF (Fig.7A) and bFGF (Fig.7B). These results indicate that neither p16INK4a nor p19ARF is necessarily involved in cell cycle arrest induced by membrane depolarization. Expression of the INK4 cdki p15INK4b in OP cells cultured with PDGF was very low and unmodified by membrane depolarization (data not shown). Blockage of K+ channels or cell depolarization inhibits proliferation of oligodendrocyte progenitor cells purified from INK4−/− mice lacking the p16INK4a and p19ARF genes. [3H]Thymidine incorporation assays in nonsynchronized mouse cells. OP cells were purified from P1 mice and cultured in DMEM-N1 plus 0.5% FBS and PDGF (A) or bFGF (B). Cells were plated in 24 well plates (3 × 104 cells per well). After 2 hr, PDGF or bFGF (both 10 ng/ml) was added to the culture medium in combination with kainate (KAI; 100 μm), TEA (10 mm), FSK (50 μm), DFSK (50 μm), or veratridine (VER; 50 μm). Cells were harvested 22 hr later, and [3H]thymidine incorporation was assessed by trichloroacetic acid precipitation and scintillation counting. Cells in N1 medium in the absence of growth factors incorporated 5615 ± 268 cpm/well per 22 hr (average ± SEM; n = 9). Averages of three experiments in triplicate ± SEM are shown. A, ***p < 0.0005; **p < 0.005 compared with PDGF. B, ***p < 0.0001 compared with bFGF. Accumulation of the cdki p27Kip1 has been recently associated with cell cycle arrest in OP cells (Casaccia-Bonnefil et al., 1997; Durand et al., 1997; Ghiani et al., 1999). We therefore analyzed whether blockage of K+ channels and cell membrane depolarization caused accumulation of p27Kip1 in nonsynchronized rat OP cells. 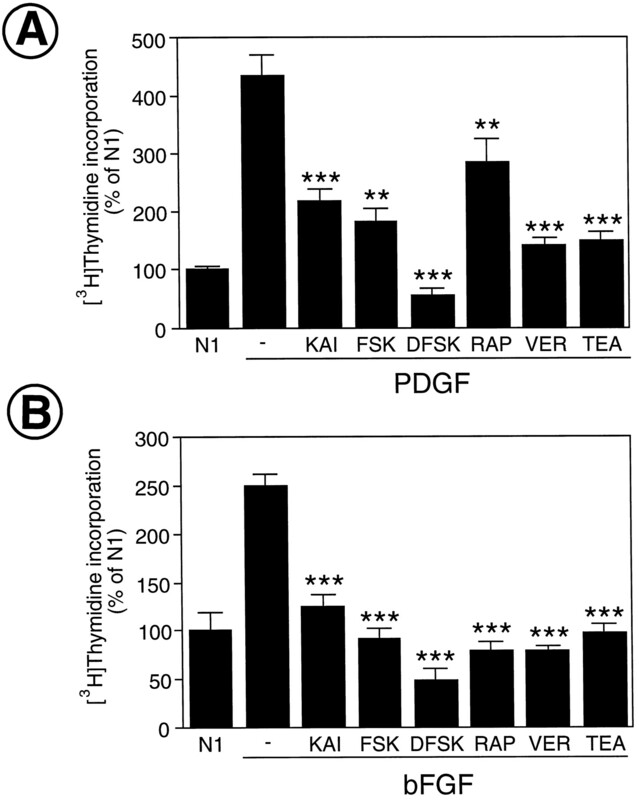 After 48 hr of treatment, veratridine, FSK, DFSK, and TEA increased p27Kip1 expression twofold to threefold over the levels observed in cells cultured in PDGF alone (Fig.8). Interestingly, p27Kip1 accumulation induced by these agents is similar to that induced by the β-receptor agonist isoproterenol and significantly higher than the constitutive accumulation measured during OP cell differentiation (Ghiani et al., 1999). Blockage of K+ channels or cell membrane depolarization induces accumulation of p27Kip1 in oligodendrocyte progenitor cells. Western blot analysis of p27Kip1 expression in nonsynchronized oligodendrocyte progenitors. Cells were plated in PDGF (10 ng/ml) in the presence or absence of isoproterenol (ISO; 50 μm), FSK (50 μm), DFSK (50 μm), TEA (5 mm), or veratridine (VER; 30 μm). Cells were harvested after 48 hr, and 15–20 μg of total protein were loaded on the gel for each sample. Histograms represent relative levels of p27Kip1 determined by densitometric analysis of autoradiographs from Western blots. Values are expressed as ratios of cells treated with PDGF alone and are mean ± SEM of three to five separate experiments. P.C., Positive control; purified p27Kip1 protein comigrates with the p27Kip1 from OP cells. ***p < 0.01; **p < 0.05 compared with PDGF alone (Student’s t test). An increase in the cdki p21CIP1 has also been demonstrated in OP cells during differentiation and under conditions that cause cell cycle arrest (Casaccia-Bonnefil et al., 1997; Ghiani et al., 1999). We therefore analyzed p21CIP1 expression in OP cells treated with veratridine and K+ channel blockers. 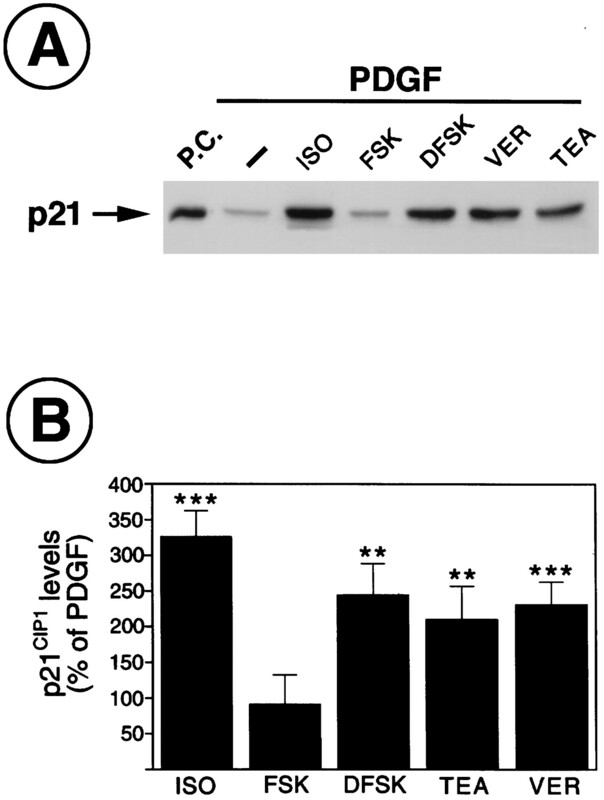 Figure 9 shows that veratridine, TEA, and DFSK caused a significant 2- to 2.5-fold increase in p21CIP1 levels, as measured by Western blot, but FSK was ineffective. Blockage of K+ channels or cell membrane depolarization stimulates p21CIP1accumulation in oligodendrocyte progenitor cells. Western blot analysis of p21CIP1 expression in nonsynchronized oligodendrocyte progenitors. Cells were plated in PDGF (10 ng/ml) in the presence or in the absence of isoproterenol (ISO; 50 μm), FSK (50 μm), DFSK (50 μm), TEA (5 mm), or veratridine (VER; 30 μm). Cells were harvested after 48 hr, and 30–40 μg of total protein were loaded on the gel for each sample. Histograms represent relative levels of p21CIP1 determined by densitometric analysis of autoradiographs from Western blots. Values are expressed as ratios of cells treated with PDGF alone and are mean ± SEM of three to five separate experiments. P.C., Positive control; purified p21CIP1 protein comigrates with the p21CIP1 from OP cells. ***p < 0.005; **p < 0.05 compared with PDGF alone (Student’s t test). In summary, these results show that both cell membrane depolarization and blockage of voltage-dependent K+channels trigger accumulation of two cdkis, p27Kip1and p21CIP1, in dividing OP cells. Nerve cell development can be regulated by the timely expression of distinct ionic channels (Cone and Cone, 1976; Cone, 1980; Chiu and Wilson, 1989; Jones and Ribera, 1994; Gu and Spitzer, 1995; LoTurco et al., 1995; Spitzer, 1995; Gallo et al., 1996; Knutson et al., 1997;Behar et al., 1998; Yuan et al., 1998; Ghiani et al., 1999) or by their modulation by growth factors (for review, see Chew and Gallo, 1999). Glial cells express membrane ionic channels with molecular and functional properties that are generally identical to those of neurons (Duffy et al., 1995; Ransom and Orkand, 1996; Sontheimer et al., 1996;Steinhauser and Gallo, 1996; Verkhratsky and Kettenmann, 1996). The function of these channels in glia is largely unknown, although some have been linked to normal or abnormal cell proliferation. Activity of outward K+ channels is higher in mitotically active Schwann cells, oligodendrocyte progenitors, astrocytes, and retinal glial cells, whereas it is greatly reduced in postmitotic cells (Puro et al., 1989; Sontheimer et al., 1989; Wilson and Chiu, 1990;Pappas et al., 1994; Gallo et al., 1996; Knutson et al., 1997). Interestingly, expression of distinct K+ currents has been linked to proliferative potential in both reactive astrocytes (MacFarlane and Sontheimer, 1997) and neuroblastoma cells (Arcangeli et al., 1995). Expression and regulation of K+ channels in myelinating cells has drawn attention for a variety of reasons. First, in oligodendrocytes and Schwann cells it is possible to identify specific developmental stages associated with a particular K+ channel phenotype (Sontheimer et al., 1989;Barres et al., 1990; Wilson and Chiu, 1990). Second, K+ channel activity in myelinating cells is clearly linked to proliferation (Chiu and Wilson, 1989; Gallo et al., 1996;Knutson et al., 1997). Finally, earlier studies have demonstrated that blockage of K+ channels can affect oligodendrocyte development and myelination (Shrager and Novakovic, 1995). In the experiments described here, we analyzed the influence of K+ channel activity and membrane potential on OP cell cycle progression by using nontoxic K+ channel blockers (TEA, FSK, and DFSK) and the Na+ channel opener veratridine, which causes OP cell depolarization (Knutson et al., 1997). One of the central findings of this study is that either blockage of K+ channels or membrane depolarization prevents OP cells from entering S phase by causing G1 arrest. This conclusion is based on observations made in OP cells maintained in G0 phase, as demonstrated by their low levels of expression of the G1 phase marker cyclin D (Fig. 4) and by their low BrdU incorporation index (Ghiani et al., 1999). In G0-arrested OP cells, accumulation of cyclin D stimulated by treatment with the mitogen PDGF was not affected by K+ channel blockers or veratridine, indicating that OP cells can still progress from G0 to G1 when K+ channel activity is blocked, or their membrane potential is depolarized. Furthermore, K+ channel blockers and veratridine prevented OP cell proliferation only if present during G1 phase and did not cause apoptosis. Finally, the G1 blockers rapamycin and deferoxamine mimicked the antiproliferative effects of K+ channel blockers, whereas the G2–M and M blockers SKF96365 and nocodazol did not affect OP proliferation. K+ channel activity regulates G1 progression in the cell cycle of distinct eukaryotic cell types (Deutsch, 1990; Dubois and Rouzaire-Dubois, 1993; Nilius and Droogmans, 1994; Wonderlin and Strobl, 1996). The intricate molecular network of proteins involved in G1–S phase progression comprises two distinct cdki families, INK4 and Kip/CIP (Martin-Castellanos and Moreno, 1997). Of these, p27Kip1 is thought to be primarily involved in cell cycle arrest of OP cells. Overexpression of p27Kip1in dividing OP cells after adenoviral infection results in arrest in cell proliferation (Tikoo et al., 1998). During development, p27Kip1 is accumulated in mitotically active OP cells to increase to maximal levels in differentiated oligodendrocytes (Casaccia-Bonnefil et al., 1997; Durand et al., 1997), and a significantly higher number of glial cells was detected in the optic nerve of p27Kip1-deficient mice (Casaccia-Bonnefil et al., 1997). We have previously demonstrated that neurotransmitter receptor agonists that cause OP cell cycle arrest also increase p27Kip1 expression (Ghiani et al., 1999). We also found that the protein levels of another member of the Kip/CIP family, p21CIP1, are increased by the same stimuli, indicating that both p27Kip1 and p21CIP1 are part of the G1 arrest pathway in mitotically active OPs. In the present study, we show that p27Kip1 and p21CIP1 accumulation is triggered by blockage of K+ channels or cell membrane depolarization. These results indicate that changes in membrane potential can activate a pathway involving p27Kip1 and p21CIP1 similar to the constitutive pathway of cell cycle arrest that occurs during development (Casaccia-Bonnefil et al., 1997; Durand et al., 1997). It can be concluded that fluctuations in K+ channel activity and membrane potential may play a fundamental role in modifying the levels of cdkis in mitotically active cells of the mammalian CNS. Cerebellar slice cultures represent a cytoarchitecturally intact system that maintains, at least in part, the complex cellular interactions that occur during neural development (Yuan et al., 1998; Ghiani et al., 1999). In previous studies, we demonstrated that agonists acting at glutamate and β-adrenergic receptors regulate oligodendrocyte development in a similar manner both in cerebellar tissue slices and in purified cultured cells (Yuan et al., 1998: Ghiani et al., 1999). This indicates that the mechanism coupling receptor and channel activity in the membrane with OP cell cycle progression is similar in situ and in cultured cells. In agreement with our previous experiments in purified cultured OPs (Gallo et al., 1996; Knutson et al., 1997), the present study demonstrates that treatment with the K+ channel blocker TEA decreased the number of OPs and preoligodendroblasts also in cerebellar tissue slices. Consistent with our findings, Shrager and Novakovic (1995) showed that myelination is severely impaired by incubation of spinal cord slice cultures with TEA, whereas neuronal function is unaffected. Our analysis indicates that the reduction in OPs and preoligodendroblasts in cerebellar slices is attributable to inhibition of cell proliferation, as shown by a parallel decrease of the BrdU incorporation index in NG2+ and O4+ cells. These findings are consistent with TEA-induced OP cell cycle arrest in cerebellar slices because of direct blockage of K+ channels, rather than indirect effects. In agreement with this interpretation, we found that TEA reduced proliferation of purified cerebellar OP cells cultured with PDGF or bFGF to 49.4 ± 6.0 and 51.7 ± 5.1% of controls, respectively (n = 9; average ± SEM; three independent experiments). It can be hypothesized that regulation of cell proliferation in the oligodendrocyte lineage, through modulation of K+channels and changes in membrane potential, is also relevant to oligodendrocyte development or regeneration in vivo. Neuronal or astrocytic release of cellular factors or ions that may modulate K+ channel function (for review, see Chew and Gallo, 1999) would also affect OP cell proliferation and development. We have previously demonstrated that K+channel function and the K+ channel phenotype of OP cells can be strongly modulated by environmental cues (Knutson et al., 1997; Ghiani et al., 1999). Retinoic acid and β-adrenergic receptor agonists do not directly block K+ channels in OP cells but reduce their functional activity, for example, by shifting their voltage dependence of activation after long-term exposure (Knutson et al., 1997; Ghiani et al., 1999). Long-term exposure of OP cells to high [K+]o caused an upregulation of inward rectifier K+ currents, a phenotype observed in postmitotic preoligodendroblasts (Knutson et al., 1997). In vivo, during their migratory and proliferative phases, OPs and preoligodendroblasts can become exposed to high concentrations of K+ ions released from axons during the propagation of action potentials. This would alter K+ channel activity by changing the K+ driving force and/or by long-term modifications in the K+ channel phenotype (Knutson et al., 1997). In conclusion, we have demonstrated that K+ channel activity and cell membrane potential play a pivotal role in the regulation of G1–S transition in glial progenitor cells. Our analysis in the present and previous studies (Knutson et al., 1997; Pende et al., 1997: Yuan et al., 1998; Ghiani et al., 1999) demonstrates that the intracellular signal transduction pathways associated with activation of different receptor systems and distinct membrane channels converge on two cdkis, p27Kip1 and p21CIP1, which regulate proliferation and differentiation in a variety of cell lineages, including oligodendrocytes (Macleod et al., 1995; Parker et al., 1995; Skapek et al., 1995; Casaccia-Bonnefil et al., 1997; Di Cunto et al., 1998;Ghiani et al., 1999). The finding that K+ channel activity and membrane depolarization modulate OP cell cycle progression in cerebral cortex (Gallo et al., 1996; Knutson et al., 1997), spinal cord (Shrager and Novakovic, 1995), and cerebellum (Yuan et al., 1998) indicates that this is likely to be a general mechanism of control of OP proliferation in the CNS. C.A.G. was partially supported by a fellowship from the National Research Council of Italy, and A.M.E. and P.L.K. were partially supported by a National Institute of Child Health and Human Development pre-Intramural Research Training Award fellowship. R.A.D. is supported by grants from the National Institutes of Health as well as an Irma T. Hirschl Award. We thank Dr. Eric Holland for help with theINK4a −/− mutant mice and for discussion. We thank Drs. Li-Jin Chew and Douglas Fields and Beth Stevens for critically reading this manuscript. Correspondence should be addressed to Dr. Vittorio Gallo, Laboratory of Cellular and Molecular Neurophysiology, National Institute of Child Health and Human Development, National Institutes of Health, Building 49, Room 5A-78, 49 Convent Drive, Bethesda, MD 20892-4495. (1990) Ion channel blockers inhibit B cell activation at a precise stage of the G1 phase of the cell cycle. J Immunol 144:2038–2045. (1995) A novel inward-rectifying K+ current with a cell-cycle dependence governs the resting potential of mammalian neuroblastoma cells. J Physiol (Lond) 489:455–471. (1997) Characterization of delayed rectifier Kv channels in oligodendrocytes and progenitor cells. J Neurosci 17:8234–8245. (1997) AMPA/kainate receptors modulate the survival in vitro of embryonic brainstem cells. Int J Dev Neurosci 15:695–701. (1990) Ion channel expression by white matter glia: the O-2A glial progenitor cell. Neuron 4:507–524. (1990) Reduction of voltage-activated K+ currents by forskolin is not mediated via cAMP in pleural sensory neurons of Aplysia. J Neurophysiol 64:1474–1483. (1998) Differential response of cortical plate and ventricular zone cells to GABA as a migration stimulus. J Neurosci 18:6378–6387. (1997) Oligodendrocyte precursor differentiation is perturbed in the absence of the cyclin-dependent kinase inhibitor p27Kip1. Genes Dev 11:2335–2346. (1989) Inhibition of voltage-dependent Na+ and K+ currents by forskolin in nodes of Ranvier. Pflugers Arch 415:322–329. (1999) Regulation of ion channel expression in neural cells by hormones and growth factors. Mol Neurobiol 18:175–225. (1989) The role of potassium channels in Schwann cell proliferation in Wallerian degeneration of explant rabbit sciatic nerves. J Physiol (Lond) 408:199–222. (1980) Ionically mediated induction of mitogenesis in CNS neurons. Ann NY Acad Sci 339:115–131. (1976) Induction of mitosis in mature neurons in central nervous system by sustained depolarization. Science 192:155–158. (1987) Forskolin’s effect on transient K+ current in nudibranch neurons is not reproduced by cAMP. J Neurosci 7:443–452. (1988) Development of macroglial cells in rat cerebellum. I. Use of antibodies to follow early in vivo development and migration of oligodendrocytes. J Neurocytol 17:43–54. (1991) Down-regulation of GAP-43 during oligodendrocyte development and lack of expression by astrocytes in vivo: implications for macroglial differentiation. Eur J Neurosci 3:876–886. (1993) Cell-cycle control of a large-conductance K+ channel in mouse early embryo. Nature 365:560–562. (1998) A cytoplasmic cell cycle controls the activity of a K+ channel in pre-implantation mouse embryos. EMBO J 17:1952–1960. (1990) K+ channels and mitogenesis. in Potassium channels: basic function and therapeutic aspects, ed Colatsky T (Liss, New York), pp 251–271. (1998) Inhibitory function of p21CIP1/WAF1 in differentiation of primary mouse keratinocytes independent of cell cycle control. Science 280:1069–1072. (1993) Role of potassium channels in mitogenesis. Prog Biophys Mol Biol 59:1–21. (1995) Potassium channels. in Neuroglia, eds Kettenmann H, Ransom BR (Oxford UP, New York), pp 185–201. (1997) Accumulation of the cyclin-dependent kinase inhibitor p27/Kip1 and the timing of oligodendrocyte differentiation. EMBO J 16:306–317. (1998) p27Kip1 alters the response of cells to mitogen and is part of a cell-intrinsic timer that arrests the cell cycle and initiates differentiation. Curr Biol 6:431–440. (1979) Monoclonal antibody to a plasma membrane antigen of neurons. Proc Natl Acad Sci USA 76:4913–4917. (1995) O-2A progenitors of the mouse optic nerve exhibit a developmental pattern of antigen expression different from the rat. Glia 15:95–104. (1998) Regulation of Schwann cell proliferation in cultured segments of the adult rat sciatic nerve. J Neurosci Res 52:530–537. (1995) Developmental and growth factor induced regulation of nestin in oligodendrocyte lineage cells. J Neurosci 15:394–406. (1996) Oligodendrocyte progenitor cell proliferation and lineage progression are regulated by glutamate receptor-mediated K+ channel block. J Neurosci 16:2659–2670. (1999) Neurotransmitter receptor activation triggers p27Kip1 and p21CIP1 accumulation and G1 cell cycle arrest in oligodendrocyte progenitors. Development 126:1077–1090. (1998) Expression of Kv1.1, a Shaker-like potassium channel, is temporally regulated in embryonic neurons and glia. J Neurosci 18:5682–5691. (1997) cAMP and forskolin inhibit potassium currents in rat taste receptors by different mechanisms. Am J Physiol 41:C2005–C2018. (1998) Modeling mutations in the G1 arrest pathway in human gliomas: overexpression of cdk4 but not loss of INK4a induces hyperploidy in cultured mouse astrocytes. Genes Dev 12:3644–3649. (1988) Effect of forskolin on voltage-gated K+ channels is independent of adenylate cyclase activation. Science 240:1652–1655. (1994) Deletion of p16 and p15 genes in brain tumors. Cancer Res 54:6353–6358. (1994) Overexpression of a potassium channel gene perturbs neural differentiation. J Neurosci 14:2789–2799. (1997) K+ channel expression and cell proliferation are regulated by intracellular sodium and membrane depolarization in oligodendrocyte progenitor cells. J Neurosci 17:2669–2682. (1988) Forskolin effects on the voltage-gated K+ conductance of human T cells. Pflugers Arch 412:133–140. (1989) Forskolin: a specific stimulator of adenylyl cyclase or a diterpene with multiple sites of action? Trends Neurosci 10:442–447. (1986) Bipotential precursors of putative fibrous astrocytes and oligodendrocytes in rat cerebellar cultures express distinct surface features and “neuron-like” GABA transport. Proc Natl Acad Sci USA 83:1504–1508. (1988) The plasticity of ion channels: parallels between the nervous and immune systems. Trends Neurosci 11:214–218. (1995) GABA and glutamate depolarize cortical progenitor cells and inhibit DNA synthesis. Neuron 15:1287–1298. (1997) Electrophysiological changes that accompany reactive gliosis in vitro. J Neurosci 17:7316–7329. (1995) p53-Dependent and independent expression of p21 during cell growth, differentiation, and DNA damage. Genes Dev 9:935–944. (1997) Recent advances on cyclins, CDKs and CDK inhibitors. Trends Cell Biol 7:95–98. (1994) A role for K+ channels in cell proliferation. News Physiol Sci 9:105–110. (1994) Reduction of glial proliferation by K+ channel blockers is mediated by changes in pHi. NeuroReport 6:193–196. (1998) Cell cycle-related changes in the conducting properties of r-eag K+ channels. J Cell Biol 143:767–775. (1995) p-53-Independent expression of p21Cip1 in muscle and other terminally differentiating cells. Science 267:1024–1027. (1994) Glial cells of the oligodendrocyte lineage express both kainate- and AMPA-preferring subtypes of glutamate receptor. Neuron 12:357–371. (1997) Neurotransmitter and growth factor-induced cAMP response element binding protein phosphorylation in glial cell progenitors: role of calcium ions, protein kinase C, and mitogen-activated protein kinase/ribosomal S6 kinase pathway. J Neurosci 17:1291–1301. (1986) Incorporation of tritiated galactose into galactocerebroside by cultured rat oligodendrocytes: effects of cyclic adenosine 3′,5′-monophosphate analogues. J Neurochem 46:300–302. (1989) Retinal glial cell proliferation and ion channels: a possible link. Invest Ophthalmol Vis Sci 30:521–529. (1995) Alternative reading frames of the INK4a tumor suppressor gene encoding two unrelated proteins capable of inducing cell cycle arrest. Cell 83:993–1000. (1978) Cyclic AMP as a mitogenic signal for cultured rat Schwann cells. Nature 273:672–673. (1989) Cyclic AMP regulates the rate of differentiation of oligodendrocytes without changing the lineage commitment of their progenitors. Dev Biol 133:437–446. (1993) Oligodendrocyte differentiation and progenitor cell proliferation are independently regulated by cyclic AMP. J Neurosci Res 34:287–294. (1996) Glial-neuronal interactions in non-synaptic areas of the brain: studies in the optic nerve. Trends Neurosci 19:352–358. (1996) Cell division and the nervous system: regulating the cycle from neural differentiation to death. Trends Neurosci 19:62–68. (1997) Regulation of voltage- and ligand-gated currents in rat hippocampal progenitor cells in vitro. J Neurobiol 32:95–110. (1994) CDKN2(p16/MTS1) gene deletion or cdk4 amplification occurs in the majority of glioblastomas. Cancer Res 54:6321–6324. (1996) Role of the INK4a locus in tumor suppression and cell mortality. Cell 85:27–37. (1995) Control of myelination, axonal growth, and synapse formation in spinal cord explants by ion channels and electrical activity. Dev Brain Res 88:68–78. (1995) Inhibition of myogenic differentiation in proliferating myoblasts by cyclin D1-dependent kinase. Science 267:1022–1024. (1998) Heteromultimeric K+ channels in Schwann cells: developmental expression and role in cell proliferation. J Neurosci 18:10398–10408. (1981) Monoclonal antibodies (O1 to O4) to oligodendrocyte cell surfaces: an immunocytological study in the central nervous system. Dev Biol 83:311–327. (1989) Channel expression correlates with differentiation stage during the development of oligodendrocytes from their precursor cells in culture. Neuron 2:1135–1145. (1996) Voltage-gated Na+ channels in glia: properties and possible functions. Trends Neurosci 19:325–331. (1995) Spontaneous activity: functions of calcium transients in neuronal differentiation. Perspect Dev Neurobiol 2:379–386. (1981) The NG2 antigen, a putative lineage marker. Immunofluorescent localization in primary cultures of rat brain. Dev Biol 83:154–165. (1987) Potential glial precursor cells of the optic nerve express the NG2 proteoglycan. J Neurosci 7:2737–2744. (1996) News on glutamate receptors in glial cells. Trends Neurosci 19:339–346. (1991) Interaction between cAMP elevation, identified growth factors and serum components in regulating Schwann cell growth. J Neurosci Res 30:346–352. (1998) Development of glutamate-induced intracellular Ca2+ rise in embryonic chick retina. J Neurobiol 34:113–125. (1998) Ectopic expression of p27Kip1 in oligodendrocyte progenitor cells results in cell cycle growth arrest. J Neurobiol 36:431–440. (1992) Nestin expression in embryonic human neuroepithelium and in human neuroepithelial tumor cells. Lab Invest 66:303–313. (1995) Embryonic hypothalamic expression of functional glutamate receptors. Neuroscience 67:419–439. (1996) Calcium signaling in glial cells. Trends Neurosci 19:346–352. (1993) Sodium channels, GABAA receptors, and glutamate receptors develop sequentially on embryonic rat spinal cord cells. J Neurosci 13:2068–2084. (1990) Potassium channel regulation in Schwann cells during early developmental myelinogenesis. J Neurosci 10:1615–1625. (1996) Potassium channels, proliferation and G1 progression. J Membr Biol 154:91–107. (1998) A role for glutamate in the regulation of oligodendrocyte development in cerebellar tissue slices. Development 125:2901–2914. (1994) Forskolin blocks the transient K current of rat cerebellar granule neurons. Neurosci Lett 181:153–157.